L.A. Forced To Rely On Police Volunteers To Save Money The Los Angeles Police Department has more than 700 unpaid workers in its Reserve Corps. The volunteers save the city about $5 million each year. But with new budget cuts hitting the department, some in the legal profession have concerns over the volunteers' role. 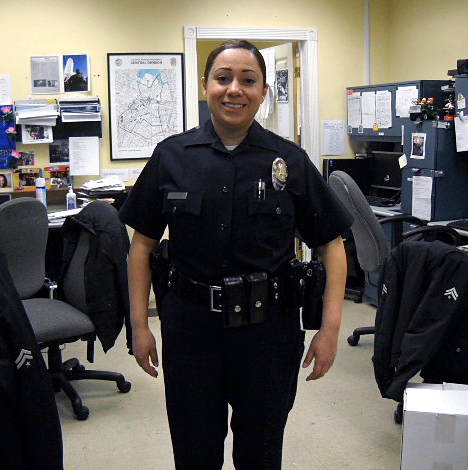 "I wear the same badge and have the same gun, same uniform," says Arcelia Ponce, who has been working as a volunteer in the Los Angeles Police Department's reserves for two years. The new budget for Los Angeles would cut $100 million from the city's police department. Officials hope to save the money by granting less overtime. And one way to do that is through the use of volunteers. The Los Angeles Police Department already has more than 700 unpaid workers in its Reserve Corps. These volunteers save the city about $5 million each year. But some in the legal profession have concerns. For anyone interested in becoming a reserve officer, the first step is the orientation meeting. Lt. Craig Herron runs LAPD's reserve unit. At a recent gathering, he surveys the room and asks how many want to join the reserves in order to become full-time officers. A few raise their hands. "The rest of you I assume always wanted to be a cop but you found an opportunity to have fame and fortune elsewhere and said, 'You know what, I can still be a reserve officer — and still do my full-time job,' " Herron says. Those in attendance include a law student and a bank teller. Vincent Lavares, 42, works in post-production for film and television. "Actually, I'm fulfilling a childhood dream," he says, "as well as giving back to the community." That's what 34-year-old teacher Arcelia Ponce had in mind when she joined the reserves two years ago. A Kevlar vest pulls her uniform tight across her shoulders, and her hand rests lightly on her police belt. As an entry-level reserve, Ponce must work alongside a full-time officer, and her assignments are usually special events like festivals and art walks. Still, she says, "I think it's equally as dangerous; we're all out there on the field. I wear the same badge and have the same gun, same uniform; I look just the same, like the other officers." A former attorney, police volunteer Marty Greenblatt uses his legal experience to help the department fight white-collar crime. Across town, Marty Greenblatt has a desk in the squad room at LAPD's Pacific Division. He's wearing a crisp blue shirt with a red-striped tie, and a gold detective badge rides low on his hips. Before becoming a reserve detective, Greenblatt, 72, was an attorney. "LAPD has a very enlightened attitude toward age," he says. "They will not stop you from going into the program as a result of your age, nor will they cut you any breaks." Greenblatt did five months at the academy and is qualified in firearms, but it's his 40 years working as a corporate attorney that he brings to this job investigating white-collar crime. "I file my own cases with the district attorney and I testify at the prelims at trials," Greenblatt says. "I get arrest warrants; I get search warrants." Reserve officers undergo the same thorough application process and extensive training as full-time officers, says Lt. Herron. "By the time you've become a level one police officer," he says, "you've gone through over a thousand hours of training, and at that point, they have as much peace officer authority as I do, 24 hours a day." According to the International Association of Chiefs of Police, more than 2,100 police departments nationwide have volunteer programs. And while training and duties vary widely, the use of volunteers in criminal investigations can raise legal and safety concerns. 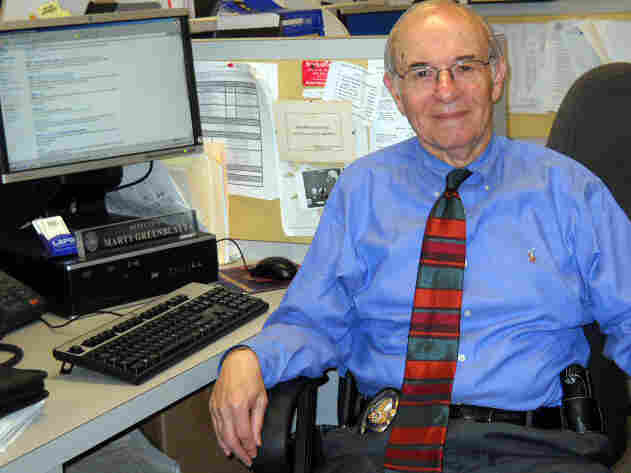 Stan Goldman, a law professor, says that while many of the volunteers might do good work and provide valuable input, he has some concerns "if you bring somebody in who rides along and actually gets involved in criminal circumstances involving crime." Goldman, who teaches at Loyola Law School in Los Angeles, says the police volunteers "may have been trained well and may have other experiences in life — but they're still only doing it a couple days a month." Working an average of 25 hours a week as a reserve detective, Greenblatt may be an exception. He works out every day to keep himself in shape and likes going out in the field, but he acknowledges that there are some limitations. "It's getting a little late for me to go chasing bad guys and try to climb over fences or whatever," Greenblatt says. "That's for these young people, young men and women, to do." He says the best part of his job is something that many detectives consider to be the worst part. "I just got two subpoenas served on me now," he says with a laugh. It's one assignment that holds no fear for the retired attorney: appearing in the courtroom.